Hey there Fabulouses! I have had a busy weekend and I haven’t stopped in here on the FabFree Blog since Friday (What? Love took a day off???) and it feels like forever ago, but I am here today to share news about a massive clear out sale you might not want to miss out on! Purplemoon Creations is closing it’s doors with a 50L sale! Yes… Unfortunately Purplemoon Creations is closing it’s doors soon, but before it’s final day (which has yet to be determined, but it will be soon), everything in the store will be 50L! All those pretty gowns, accessories and casual outfits…. 50L! I’m wearing the boho styled Charlotte Outfit that was 50L for the lace trimmed blouse and floral printed jeans. Sweet deal right? Categories: events, mesh, pants, shirt | Tags: 50L sale, Avi-Glam, Belle Poses, Catwa, Elle Boutique, Euphoric, fab free, fabfree, fabulously free in SL, free in sl, Glam Affair, group gift, kustom9, Love Trill, maitreya, Mother Road, PurpleMoon Creations, Purplemoon Creations closing sale, Second Life, second life closing sale, second life gift, sl, sl free, SL Freebies, Stealthic, The Liaison Collaborative, TLC | Permalink. Categories: Free, hunts, mesh, outerwear | Tags: Avi-Glam, Catwa, fab free, fabfree, fabulously free in SL, free in sl, Glam Affair, hunts sl, Kunglers, Love Trill, maitreya, Mother Road, navy & copper, Pixicat, Reign, Sari-Sari, Second Life, Second Life Free, second life free clothing, second life hunt, Shiny Shabby, sl, sl free, sl free clothes, sl hunt, XOXO Hunt | Permalink. To get this gift, you will need to head over to Giulia Design and join the Mesh Appliers Sales & Freebies (MAF) in-world group. The group is free to join. Categories: group gifts, jewelry, pants, shirt | Tags: amala, An Lar Poses, chain, fab free, fabfree, fri.day, Giulia Design, glitzz, lelutka, Magika, maitreya, Mother Road, Second Life, Serena Snowfield, YS*YS | Permalink. I was looking through a box of old photos and found this picture of me hamming it up during my ’70s boho days on Route 66. But a visit to The Mother Road sim reminded me of the decade I spent living in the High Desert of California. I didn’t live in a trailer in the middle of nowhere, but just a mile or two from my house you could find scenes that looked remarkably like this one… tumbleweeds and all. To create my boho look, I stopped by The Boho Culture Fair (TBCF) and picked up a few of the MANY generous gifts. First off, my outfit is TBCF gift from Rir Life. The Bartot Top & Lagenlook Pants are a really fun, carefree look. You can’t see them here, but the pants have a short flare on each side, almost like they were made of big scarves. The top ties at the waist with just a hint of skin showing. Both top and pants are sized for Belleza, Maitreya, and Slink mesh bodies. My Dream Catcher Choker is a free TBCF gift from SAGA. It comes with a HUD that includes 4 different metal colors for the leaves. Click the choker for the blue resizer menu. My bracelet is a free TBCF gift from !IT! It includes a HUD with 10 different metals and is resizeable through the HUD. Like my pose? You can pick it up as a gift from Stonerella at TBCF. Be sure to wear your Bento hands for the full effect. The Boho Culture Fair runs through November 9, so you still have a few days to stop by. I could not give you direct landmarks to the individual vendors because you’ll wind up back at the landing point, but you can always do an area search to find what you need. You do need to join the Fair Lovers or Hunters in-world group to pick up most of the gifts – it is only 1L to join. BTW, Kat already showed this cute strapless dress by Gypsy Chic that you can pick up at TBCF landing point. Be sure to grab that one, too! 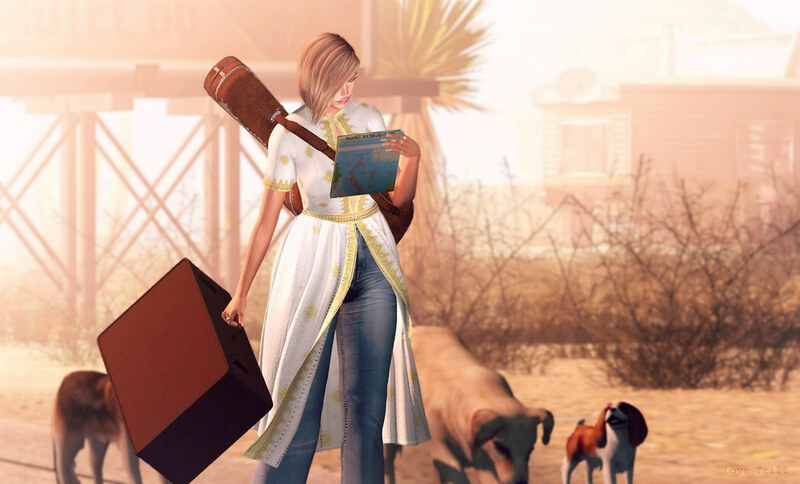 Categories: accessories, jewelry, pants, poses, shirt | Tags: Avi-Glam, elikatira, fab free, fabfree, fabulously free in SL, Indulge Temptation, Izzie's, lassitude & ennnui, lelutka, maitreya, Mother Road, Pink Fuel, powder pack, Rir Life, saga, Second Life, Serena Snowfield, sl, stonerella, The Boho Culture Fair, vista animations | Permalink. Hello Fabulouses, and Happy Weekend! Ripley and I have truly been enjoying the arrival of cooler temperatures in the desert. For the past two days, we’ve ventured out for long morning walks. The bright sunshine washed everything in our path with a clear, brilliant light, yet the air was still tempered by the early hour. After many months of sweltering triple digits, we are savoring the arrival of more fall-like weather. but it is still very warm in the afternoon, so long pants are not really an option for me in RL yet. I was very happy to stumble across this cute Aurola outfit in the Desire shop on the Marketplace! With a knotted crop top and sporty drawstring-style shorts, this casual combination was ideal for an early morning jaunt with the pupster. Although I opted for a midnight hue with white piping, Aurola includes a full fat-pack, which offers 18 colors for the top, and 15 for the shorts, so if black isn’t your favorite, you have many other options available. Best of all, you can scoop up this versatile top and shorts combo for only 5L! Here’s hoping you are enjoying some splendid, early autumn weather yourselves. Until my next post, happy shopping! Categories: accessories, jewelry, makeup, Marketplace, mesh, Mesh Heads, pants, shirt, Uncategorized | Tags: argrace, Catwa, Desire, fab days, fab free, Fab Free in SL, Fab Free Sl, fabfree, fabfree in secondlife, fabfree in sl, fabfree second life, fabfree sl, fabfreesl, fabulously free in SL, Glam Affair, Ikon, Izzie's, Jian, Kathryn Vayandar, maitreya, Mother Road, Primavera Pose Shop, SimplyScha, sl freebie blogs, Snow Bound, [ROC] | Permalink.